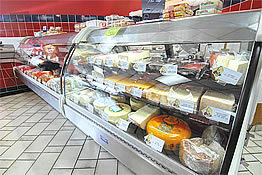 Roma Bakery’s deli feature a large variety of domestic and imported cheeses, cured meats and cold cuts. We also have an open cooler with pizza dough, sauce and the various ingredients needed to make your own pizza at home. Also, do not forget about those antipasto necessities!